Chapter 1: PMCA for diagnosis and prion propagation studies. Chapter 2: Fractionation of prion protein aggregates by asymmetrical flow field-flow fractionation. 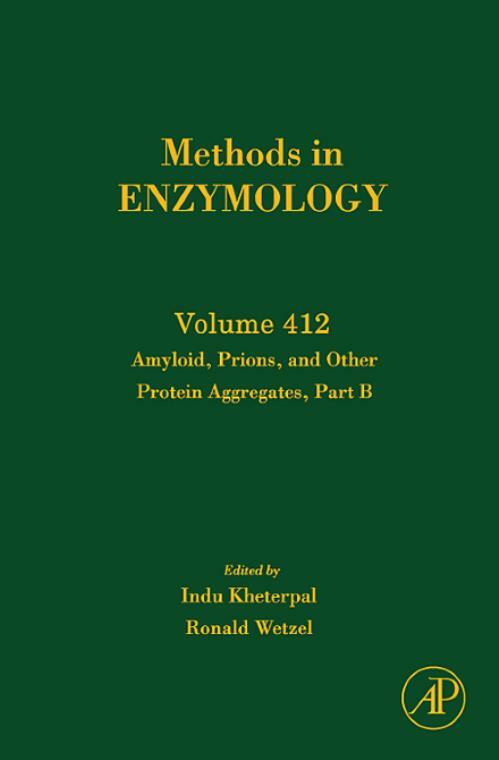 Chapter 3: Analysis of Amyloid Aggregates Using Agarose Gel Electrophoresis. Chapter 4: Characterization of Systemic Amyloid Deposits by Mass Spectrometry. Chapter 5: Proteomics of Polyglutamine Aggregates. Chapter 6: Merger of Laser Capture Microdissection and Mass Spectrometry: A Window into the Amyloid Plaque Proteome. Chapter 7: MALDI MS Imaging of Amyloid. Chapter 8: Imaging polyglutamine deposits in brain tissue. Chapter 9: X-34 labeling of abnormal protein aggregates during the progression of Alzheimer's disease. Chapter 10: Visualizing Pathology Deposits in the Living Brain of Alzheimer's Disease Patients. Chapter 12: An efficient protein transformation protocol for introducing prions into yeast. Chapter 13: Screening for genetic modifiers of amyloid toxicity in yeast. Chapter 14: Searching for anti-prion compounds: Cell-based high-throughput in vitro assays and animal testing strategies. Chapter 15: A Drosophila Model of Alzheimer's Disease. Chapter 16: A C. elegans model of polyglutamine disease. Chapter 17: Nucleation: the Connections between Equilibrium and Kinetic Behavior. Chapter 18: Computational Approaches to Amyloid beta Fibril Core Structure. Chapter 19: Amyloid beta-protein aggregations: Ab initio discrete molecular dynamics approaches.